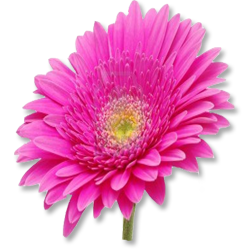 Gerbera flowers comes in vibrant colours adding beauty to your garden. It has around 40 species spreading from Africa across to Madagascar into tropical Asia and South America. 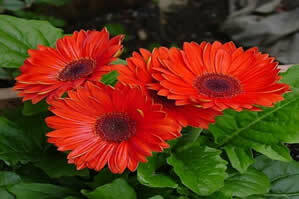 Gerbera are plants with a height up to 45 to 60 cm and 10 to 25 cm diameter flowers. There will be more than ten leaves in a plant, medium green in colour spread out in a circle parallel to the ground. These plants can be planted in gardens, mixed containers and pots. Its cut flowers last long and gives colour and beauty to any room. There are many hybrids that come in white, cream, yellow, orange-pink, purple or violet. These plants are usually grown in greenhouses and are used for cut flowers. Gerbera flowers all year round. Propagation may be achieved through seeds, basal cuttings or through dividing. Basal shoots or cuttings from the parent plant should be taken in summer (March- April). Seeds are sown or cuttings can be inserted in sandy soil until the saplings become an inch tall or the cuttings form roots. Plants grown from seeds can differ from the parent plant and seeds which do not germinate within about twenty days are likely not to germinate at all. Replanting is done in April. The saplings (germinated seeds) and the cuttings can be replanted in pots filled with a mixture of sand, dried organic mix, loam. When repotting ensure the crown of the plant is above the level of the soil. Until the plants establish, they should be kept in shade and sprinkled with water. After that no shading is necessary. The established plants lasts for 3 to 4 years. After that flowers will lessen and the growth of the plant will get stunted. For best results the plants need a liberal amount of sunlight and water. Half day of direct sun and half day of partial shade and remaining slightly moist at all times is ideal. High source of light can give an abundance of flowers. 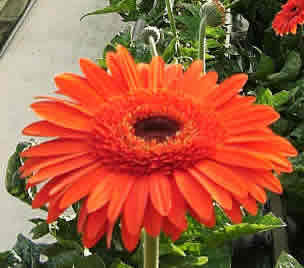 Healthy gerberas are rarely bothered by pests. Fungus and stem rot is a common problem with over watered plants. Remove old leaves regularly to prevent fungus infections. Jaffa, Sangria, Rosula, Oprab, Romona, Salina, Tecora and Starlight. The harvesting stage is critical as the flowers should not be cut before the outer row of flowers show pollen, or the flowers will wilt and close at night. Optimum storage temperature (wet) for gerbera is 40C. The flowers could be stored efficiently up to 4 weeks. 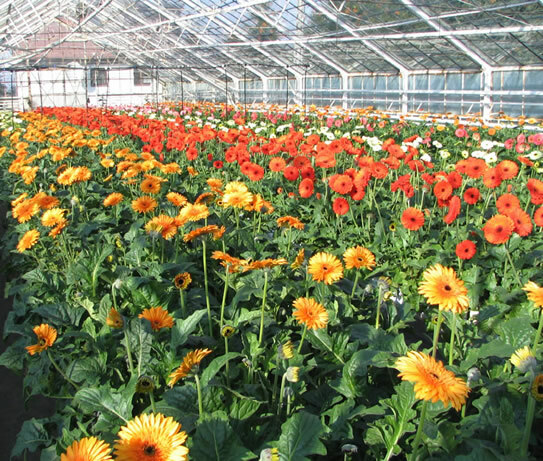 Most modern cultivars of gerbera yield 250-300 good quality flowers/m2/year. These flowers are produced for export purpose and also for domestic market. Since cutflowers are of specific type and produced in polyhouses they are fresh and tender and since they are produced for specific purpose, great care is needed in their marketing viz. packing, handling, storage and transport. There should be minimum handling and transport should be quick with cooling and refrigeration facility.